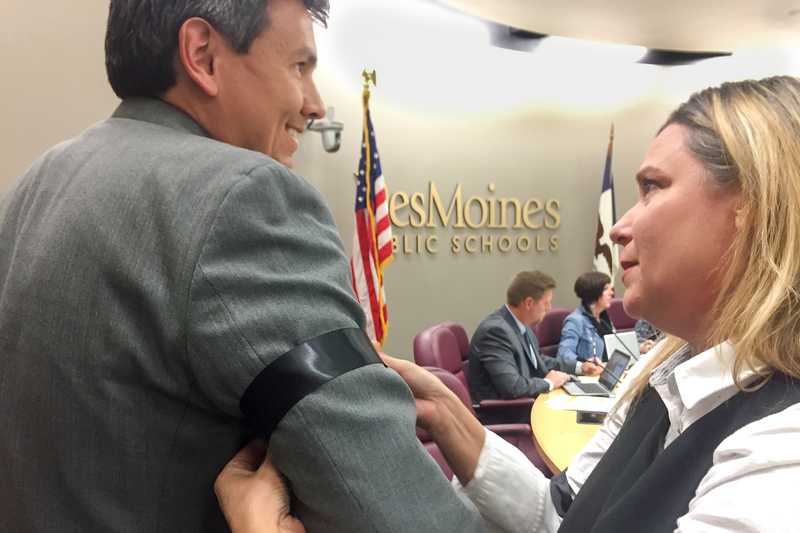 School Board member Heather Anderson ties a black arm band on colleague Rob Barron. Board members wore the arm bands, a symbol of the Tinker case, as a sign of support for the speech rights of students. Tuesday night’s School Board meeting was standing-room only as hundreds of people showed up in response to last week’s walk-out by students the morning after Election Day. Des Moines Public Schools is thankful for everyone who took the time to attend the meeting, and appreciates that there are a variety of opinions about the student protest. While one individual did speak out against the students right to protest, dozens of students spoke about why they felt it was important for them to speak out following the election and concerns they had for themselves, friends and families. Many parents, community members, and elected officials also spoke in support of the students and expressed their appreciation for the school district recognizing the rights of students. Several School Board members wore black arms bands, the symbol for the Supreme Court’s Tinker decision of 1969, as a sign of their support for the rights of students. This past week I’ve been doing a lot of listening to a variety of opinions and one of the biggest takeaways I had was that the results of this election were the outcome of a system where so many have felt they didn’t have a voice. So does it really make sense for us to in turn suppress the voice of our youth? They also are protected by the rights given by our Constitution. And as the elected governing body of this school district each of us took an oath right next to this flag to uphold those rights even when it allows for the expression of opinions that differ from our own. The right to practice freedom of speech doesn’t just live outside the walls of Des Moines Public Schools. Nor is it reserved for adults or for the expression of only certain viewpoints. We have a storied history here in Des Moines around free speech with the landmark Supreme Court Case Tinker vs. the Des Moines Independent School District where it was determined that “students do not shed their constitutional rights at the schoolhouse gate.” While the circumstances of the Tinker case were different in that it was a passive protest signified by black arm bands in response to war, some of us here have chosen to wear a black ribbon this evening to remember the outcome of the Tinker decision and the protections granted our students. To be clear, in no way do these ribbons signify a response to the outcome of the election. Last week’s walkout was led by students, many of whom are not old enough to vote but for whom the outcome of this election holds significant consequence for their futures. When the district became aware of the students’ plan it was the decision of administrators to support that walkout with limits and boundaries that would better ensure the rights and safety of all of our students than would obstruction or no action at all. That is because school districts are at times called to the challenge of weighing and balancing the sometimes clashing needs to provide students a safe, orderly school environment conducive to learning with their freedom of speech and rights to engage in expressive activity. The bottom line is that it is important to remember that we have throngs of students in this district who feel like the country they call home, the country that they love doesn’t love them back. I’m asking that we stretch to understand that. We also need to remember that we have students who are feeling marginalized because they hold views that are different than their peers. I’m asking that we stretch to understand that too. And to keep them all as safe as possible under our watch. This is what we are called upon to do as leaders, as educators, and as a community… and something for which all of our students are counting on.